The District of Columbia Levee System, also referred to as the Potomac Park Levee System, was constructed near the National Mall by the U.S. Army Corps of Engineers (USACE) in the 1930s to reduce Potomac River flooding to Southwest D.C., the Federal Triangle and other areas west of the Capitol. Operated and maintained by the National Park Service (NPS), this levee system has been protecting Southwest from severe flooding for nearly a century. On Oct. 30, USACE and NPS hosted a public meeting at Westminster Presbyterian Church to share information with attendees on the results of a safety risk assessment completed for the District of Columbia Levee System. DC Homeland Security and Emergency Management Agency (HSEMA) also presented on flood preparedness measures for property and business owners/renters and evacuation procedures. This meeting was held as part of a nationwide effort USACE is leading to individually assess levees across the nation to determine their safety risks and present this information to the public. “In analyzing these risks, the Corps not only looks at the condition of the levee system, but also considers how often the area may flood and the population and development at risk behind the levee system,” said Johnson. The District of Columbia, including Southwest D.C., can be flooded three ways: Potomac River freshwater flooding from the upper watershed, Potomac River tidal/storm surge flooding (including during a hurricane) and interior/stormwater flooding. The levee system reduces risks from freshwater and storm surge flooding. The last major riverine flood occurred in 1996, and the last major tidal flood occurred during Hurricane Isabel in 2003. It is estimated that the levee system reduces the risk for a flood that has between a 0.2 and 0.1 percent chance of occurring in a year. A 0.2 percent chance equates to a 1 in 500 chance of occurring in a year. A 0.1 percent chance equates to a 1 in 1,000 chance of occurring in a year. Though the levee system reduces risk from major flooding along the Potomac River, there still remains the threat of interior flooding, which is caused by heavy localized rainfall that falls directly over the District in a short period of time and overwhelms stormwater systems, like what was experienced in 2006. Even if residents are not likely to be affected by river flooding, it is likely they will be impacted by interior flooding. The area behind the levee contains more than 40,000 people and $14 billion in property, including assets and infrastructure of national importance, such as congressional offices, national monuments, the Smithsonian, the National Gallery of Art and the Metro subway system. 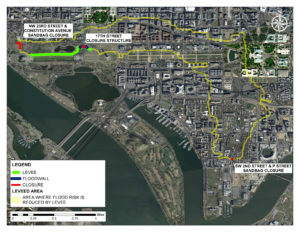 If the levee were to overtop with water and break during a severe Potomac River flood, flood depths in certain areas of Southwest D.C. could be greater than 15 feet. For links to the presentation and handouts from the meeting, go to https://silverjackets.nfrmp.us/State-Teams/Washington-DC. You can also plug in your address and manipulate various flood depths to see when you may flood at your location through an online tool known as the Anacostia and Potomac River Flood Inundation Mapping tool, found at https://www.weather.gov/lwx//PotomacInundationMaps. Finally, sign up for AlertDC at http://alertdc.dc.gov.